Well, we are recovered from the Jane Sassaman Seminar but still reliving pleasant memories of it. Margy is over on the West Coast visiting with her Mom and Dad and helping her Mom recuperate from knee surgery. I am back from the wedding weekend and happy to be getting back to normal or as normal as it ever gets. We are busy straighting up the reds from the Valentine special and the Pokey's are heading home to their owners. We are so thrilled that people participated and a big applause for their efforts. They were creative and made us all smile. Again thank you!!!! This week has a few classes such as Port Hole Ibis, Whimsical Garden, and the final Bread and Butter called Yule Logs on Saturday, February 19th. Please check out our website for pictures and all at www.jampatch.com. We also had pictures in last week's newsletter that you can always check out on our website under Newsletters. 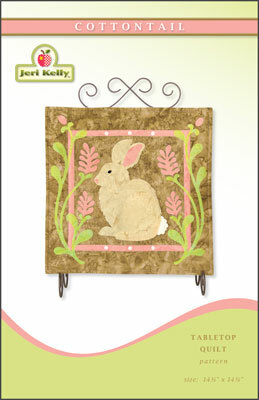 The Beginning Fusible Applique Class is on Monday, February 21st and is the adorable Bunny called "Cottontail." NEWSFLASH: A new class has just been added on Wednesday, February 23rd with Kim Ewing. It is "Woven Tablerunner" and will be $35.00. We do have UFO days on Tuesday, February 15th and next week quite a few beginning on Tuesday, February 22nd, Thursday, February 24th and ending on Friday February 25th. Three UFO days...that should be a help on getting the projects you are working on done. Saturday, February 26th begins with Farm Fresh and at 1pm the Sample Spree will begin. The Samples we have had at the store for the last Five Years will be placed on sale. A great way to get a top already done or even ones that are totally quilted. This is the time to tell your friends that want a quilt to come and buy it. And a drum roll please the 5 Quilt Give Away will begin. We hope you will be here to put in your last slip and to tell us what group you would like to win. It should be fun!!!!!!! The new special is GREENS. They will be 25% off with a minimum one yard cut. No Clubhouse Gift Certificates can be used on sale merchandise. The batiks and 2011 Christmas are excluded from this sale. The sale will run from Tuesday, February 15th to Monday, February 21st.